When developing the Boroondara Community Plan, we examined data indicative of the health and wellbeing status of the Boroondara community. Overall, we discovered that the Boroondara community reports good health and quality of life. These health priorities represent the most significant preventable causes of poor health and wellbeing in Boroondara, as well as those areas where we can work with local health and community organisation partners to make changes that influence the health outcomes of the community. These priorities are also based on the Victorian Public Health and Wellbeing Plan 2015-19. Our focus on these areas will contribute to improved health and wellbeing for Victorians. Mental wellbeing is the embodiment of social and emotional wellbeing – not merely the absence of mental illness. It is a dynamic state in which people are able to develop their potential, work productively and creatively, build positive and respectful relationships with others, and meaningfully contribute to the community (VicHealth, 2018). A 2015 survey by VicHealth included five indicators measuring mental wellbeing. The average resilience score among adults in Boroondara (18+ years) was 6.4 out of eight (where eight indicates high resilience), with young adults aged 18-24 years showing the lowest resilience (5.8). VicHealth points out that that youth is a period of high risk for developing mental illness. For all young people to be successful into the future, resilience is an important asset required. Boroondara had lower mental wellbeing status compared to Victoria on two of the mental wellbeing indicators: 69.1% of Boroondara residents agreed that people in their neighbourhood are willing to help each other compared to 74.1% in Victoria, and just over half the Boroondara residents agreed that they live in a close-knit neighbourhood (51.7%) compared to 61.0% in Victoria. However, Boroondara residents were more likely to agree to the statement “people in this neighbourhood can be trusted” than in Victoria generally (76.6% compared to 71.9%). Scores were derived from these two items measured on 5-point Likert scales, ranked from ‘strongly agree’ to ‘strongly disagree’, which were then combined and converted into scores out of 100. Scores on this indicator were divided into three categories, where ‘low’ represents a score equal to or less than 70, ‘medium’ represents a score of 80 or 90 and ‘high’ represents a score of 100. The proportion of those with a low gender equality score was used as an indicator of support for gender equality in relationships. Among the Boroondara residents interviewed, it was revealed that 30.4% had a low gender equality score. This is lower than the percentage in Victoria (35.5%), indicating that Boroondara had a better score in terms of attitude to gender equality. Psychological distress is an important risk factor of heavy drinking, smoking and drug use. It has also been directly linked to several diseases and conditions such as fatigue, migraine, cardiovascular diseases, injury, obesity, depression and anxiety (VicHealth 2016). A measure of psychological distress, the Kessler 10 Psychological Distress Scale (K10) has been included in the Victorian Population Health Survey to assess levels of psychological distress within four categories - low, moderate, high, and very high. Most Boroondara residents reported having low levels of psychological distress (70.3%), a higher proportion than across Metropolitan Melbourne (61%) but 10.5% residents reported to have high or very high levels of psychological distress (see Table 2). The Victorian Emergency Minimum Dataset (VEMD) collects information on emergency presentations at Victorian public hospitals. Table 3 shows the top ten causes of injury in Boroondara in 2016-17. Of all Boroondara residents who received emergency service/care where the primary diagnosis field was injury, the leading cause of injury was reported to be fall from less than one meter height (35.% of all injuries), followed by struck by collision with person (14.2% of all injuries). Some injuries were dominated by males. As shown in Table 4, more than three-fourths of injuries sustained by cyclists occurred among male residents. Collisions with persons and objects were also common in males. Human intent of injury is defined as clinician's assessment identifying the most likely role of human intent in the occurrence of the injury or poisoning. As shown in Table 4, females were predominantly involved in intentional self-harm. Through its links to injury, accidents, violence and more than 200 physical and mental illnesses, alcohol is one of the top 10 avoidable causes of disease and death in Victoria (VicHealth 2013). Regular, excessive consumption of alcohol places people at increased risk of chronic ill health and premature death, and episodes of heavy drinking may place the drinker (and others) at risk of injury or death. Residents in Boroondara reported a higher increased lifetime risk and a higher increased single occasion risk of alcohol-related harm compared to Melbourne overall (Table 5). The City of Boroondara also had higher rates of alcohol-related hospital admissions in 2014 compared to the Eastern Metropolitan Region and Victoria overall (Table 6). The City of Boroondara also had higher rates of alcohol-related hospital admissions in 2014 compared to the Eastern Metropolitan Region and Victoria overall (Table 7). Table 8 compares rates of drug and alcohol related ambulance attendances per 10,000 people for Boroondara and Metropolitan Melbourne from 2013-14 to 2016-17. In 2016-17, Boroondara had a lower ambulance attendance rate than metropolitan Melbourne for the majority of the drugs. Alcohol (alcohol intoxication related or alcohol-only related), had the highest rate of ambulance attendance both in Boroondara and the Metropolitan region. It accounted for 47.8% of all attendances in Boroondara and 49.7% of the attendances in the Metropolitan region. The greatest increase in ambulance attendance rates in Boroondara between 2014-15 and 2016-17 was in pharmaceutical drug-related attendances with an overall increase of 23 per 10,000 people. Boroondara has a higher trend in the rate of people being admitted to hospital with alcohol-related causes than the Eastern Metropolitan Region (EMR) and the metropolitan Melbourne region. 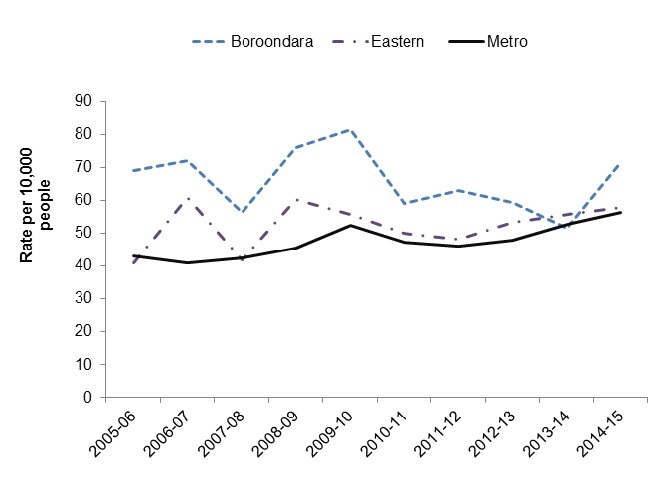 Figure 1 shows that the rate of alcohol-related admissions in Boroondara had been trending down since 2009-10 until 2014-15 (with a slight increase between 2011-12 and 2012-13) when the lowest rate was observed in 10 years. However it went up in the following year (2014-15) with a 20% increase. Rates in both the EMR and the metropolitan Melbourne region have steadily increased from 2011-12 to 2014-15. Energy dense but nutrient-poor foods contribute more than one-third of the total daily energy intake of contemporary Australians, and only one in 10 adults meet the recommended minimum daily intake for vegetables. As a result, one in four Victorian adults are now obese. Poor nutrition accounts for around one-sixth of the total burden of disease and costs Victoria between $1.25 and $4.15 billion every year (VicHealth 2013). Daily intake of fruit and vegetables is used as a measure of the quality of a diet in Australia and internationally. Less than one in 20 people in Boroondara and metropolitan Melbourne eat the recommended servings of both fruit and vegetables. Table 10 compares Boroondara’s level of compliance with the Australian fruit and vegetable guidelines against the Eastern Metropolitan Region and Victoria. Less than 5% of Victorians, including Boroondara residents, complied with both fruit and vegetable consumption guidelines. This is due to low compliance with the vegetable guideline, with nearly half meeting the fruit consumption guideline. Forty-five percent of Boroondara residents met fruit consumption guideline about 4% less than the Eastern Metropolitan Region. Physical activity is a major modifiable risk factor for a range of conditions, including cardiovascular diseases, Type 2 diabetes, some cancers, osteoporosis, depression and anxiety, and falls among the elderly. The Victorian Population Health Survey 2014 included questions about the time spent on a variety of physical activities (for example walking, vigorous household chores and keep-fit exercises). The survey placed people into three categories of activity: sedentary; insufficient time and sessions; and sufficient time and sessions. In 2014, more than half of Boroondara's residents met the criteria of sufficient exercise (55.1%), a higher proportion than for Melbourne overall (Table 11). Boroondara also had a higher percentage of residents (55.1%) with insufficient time and/or session for physical activities.